Discovering innovative and talented Girlbosses is just one perk of doing what I do, but getting the opportunity to hear their stories and to learn from them is amazing! There are some incredible benefits to hearing and sharing the stories of amazing women. As women in business, we should always seek out new opportunities to learn. Why not learn from women who have gone through the process before you? These women have failed and succeeded, and oftentimes I find that they have failed many times and somehow have found the will to get back up again. By the time I have the opportunity to speak with them, they have finally found success and have a lot of words of wisdom. There is nothing that is easy about launching a business and taking it to a level that allows you to feel as if you have really achieved success. Having a great tribe to support you makes a huge difference, but working with someone else isn’t always easy. When you have a vision of your brand, having to compromise your vision to blend seamlessly with that of your partner can be challenging, and yet, Erika Shumate and Christine Luby have created an innovative brand that will change the way you approach fragrance shopping. The two friends met at Stanford Business School while performing for a musical and have since gone on to launch Pinrose, a quality fragrance brand for the modern millennial. Pinrose fragrance is customized to your personal needs, and it’s easy to take the individual packets with you on the go. 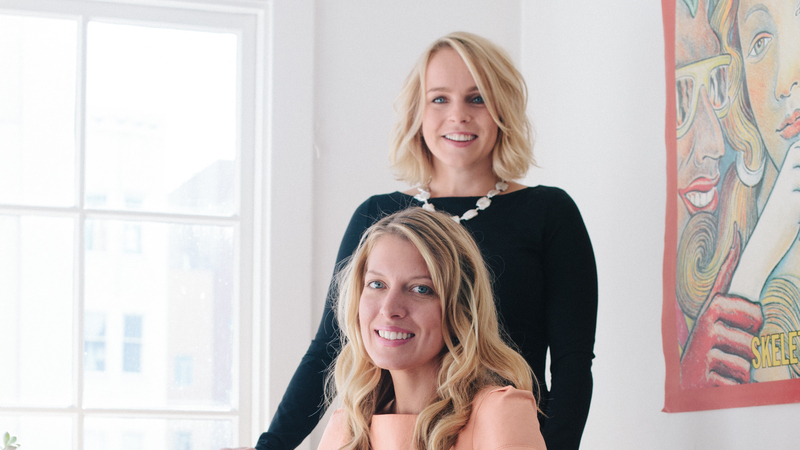 I had the opportunity to interview Erika and Christine, and the fearless Girlbosses discussed the challenges and perks of working together, their unique approach to branding and what it takes to create a bold female-owned brand. What experience would you like us to have with Pinrose? More than anything, we want Pinrose to be a nugget of fun in your life. Finding a new fragrance should be a playful, joyful experience. That is why we created our scent-finder quiz — to de-stress the experience of learning about fragrance and give you a little bit of insight into your sensory psyche. When you arm yourself with a Pinrose fragrance, it should add a skip to your step and a twinkle in your eye. Why did you believe that you would be great partners? 1. We had similar visions for what we wanted to build. 2. We trust each other completely. Erika and I first met while performing onstage in a student musical at Stanford Business School. We became friends instantly. We were confident in making the leap from friendship to business partners because, ultimately, we’re “weirdos” cut from the same cloth, and we felt that our “out-there thinking” was exactly what would help us stand out and thrive in an overly commoditized, stale market. Finally, we knew our “business marriage” would work because we trust each other completely and share the same values. What are some of the challenges that you face as co-founders, in your friendship as well as your partnership? 1. Be overly communicative. If something is bugging you, speak up. 2. Check your ego at the door. Conflicting opinions should never be taken personally. 3. Trust one another to empathize and always listen to both sides before coming to a decision. What are some of the unique ways with which you approach branding? We think of ourselves as the anti-signature scent, and our branding reflects that ethos. For too long, this idea of finding one fragrance that defines you has been forced upon us. How stressful is that! Being forced into a singular bucket makes shopping for a fragrance feel hard — a cumbersome, stressful commitment. We wanted to squash that pressure and allow women to play with their fragrances — and that is the cornerstone of our branding. As women, we are not one-dimensional. Each of us is unique and has many different — and often conflicting — qualities. We can be equal parts badass, sensitive, goofy, serious, adventurous and quiet — we are many things. Our fragrances showcase and celebrate the nuanced facets of our personalities. What makes your approach to branding genuine? Each of our scents reflects our own daydreams, ambitions and personalities. At times I am a quieter, intimate Pillowtalk Poet. Other times, I am ready to find trouble and let my inner Campfire Rebel roar. We created five unique scent personas to reflect who we are and where we want to go — wearing our scents help us to transform into the best personal version of ourselves. How do you create a genuine connection with your audience and everyone who makes a purchase? Our customers are our oxygen and the reason we are doing this. Erika and I believe that all of this hard work — the long nights, the stress and uncertainty of running a startup — is all worth it if we can give our customers a moment of joy when they use Pinrose. We actually crowdsource our new scents from what our customers tell us they want. We interact with customers primarily through various Facebook groups we have created, and we even have them test our scents out before we release anything. As for making each purchase feel special, Erika and I spend 10 percent of our day reaching out to customers to hear firsthand what they like and don’t like. This is the most fun part of our jobs and helps us deliver the best products to the Pinrose community. Do you have any 2016 goals? Our primary goal for 2016 is to bring the Pinrose experience to all Sephora stores nationwide. We are launching in 20 stores on March 18 and will roll out more soon after that. We want to reinvent the way people shop for fragrance in a retail environment. We’re bringing scent-finder technology into Sephora so that you can learn more about why you like the scents that you like while getting to smell the scents onsite. What strategies do you have in place for achieving your goals? How would one eat an elephant? One bite at a time. That is the backbone of all of the strategies that we put into place. As a team of five, it can be daunting to run an e-commerce website, manage an all-stores Nordstrom rollout, a QVC and an upcoming Sephora roll out. So, to keep us from getting overwhelmed, Erika and I break our weeks and days down into micro-tasks. What are the three things that really matter to us on a given week? What are the baby steps we need to take? We write them down and then get to work. Whenever we get stuck facing a task that we just hate, we implement the second most important strategy: play acting! For example, I just don’t like dealing with accounting. So when it comes time to deal with this thorny task, I think back to being a 5-year-old and “pretend” to be an accountant. I pretend I am having so much fun organizing our debits and credits and before long — voilà! The task has been completed — and my procrastination has been minimized. What was the best business decision that you made in 2015, and how do you hope to take advantage of that going into 2016? Partnering with Nordstrom in 2015 was a huge moment for us as a start-up. This national retailer has been a great partner, and our success in this channel has proven that we can make the retail shopping experience so much more fun and interactive. We have learned so much from the Nordstrom fragrance team. Every single person whom we have met at Nordstrom — from our buyers to the fragrance counter managers to the IT guy — treats the customer with unbelievable care and kindness. Customer service permeates the culture, and it is something we want to emulate at Pinrose. We will take this experience with us as we enter 2016 and the exciting projects we have planned.